Rochester's annual, week-long mural-making festival, Wall Therapy, kicked off officially on Friday, July 18. Most of the out-of-town artists have arrived and are now working on their large-scale public artworks under this year's portraiture theme. Due to scheduling, a couple more artists will have arrived by midweek and have a later start. Gloomy weather and downpours held up production on some of the pieces, but the promise of sunnier days ahead should help matters considerably. Sam Rodriguez's work at 40 Greenleaf Street. San Diego artist Sam Rodriguez arrived on Thursday, a bit ahead of the rest of this year's lineup, and began his piece at Atlantic and Greenleaf Streets -- the site of Wall Therapy's "Writes of Spring," which took place in April. 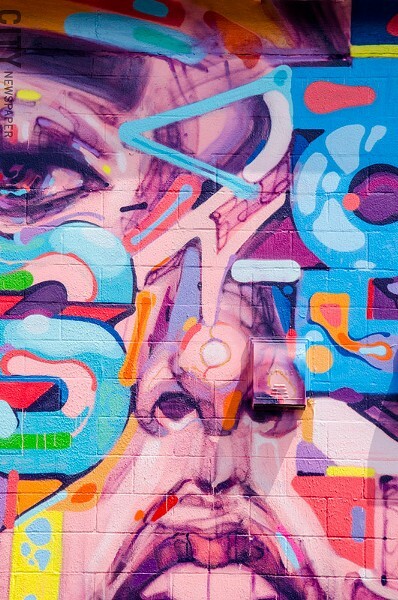 He has since finished his mural, a brightly hued and beautiful face enhanced with elements of typography. This is Rodriguez's first time to Rochester, and he brought his young family along on a working vacation. OMEN 514, of Montreal, is working on a painterly portrait of a lovely lady also at Atlantic and Greenleaf. Air conditioning units and crenulations in the warehouse walls disappear as the viewer takes in the gal's delicate features. One eye is subtly lost as OMEN characteristically toys with obscurity. The work is a striking representation of flesh and shadow so far. New York City-based artist Alice Mizrachi began painting Saturday in the Susan B. Anthony Neighborhood, on the north side of 53-59 King Street, facing Silver Street. Mizrachi invited students from Rochester Prep to paint with her throughout the weekend, and together with the kids, she coordinated work on a piece which features a diverse group of faces and the words, "Together we stand in peace." The artist will continue working solo throughout the week at the same location. Also working at 53-59 King Street is Baltimore-based artist Ernest Shaw Jr., who is nearing completion on his prismatic portrait of Jimi Hendrix's captivating gaze. A bit of historic trivia: in July of 1967, The Jimi Hendrix Experience was set to open for The Monkees in Rochester, but having quickly grown weary of mindless teen girls calling for the British headliners during his set, Hendrix left the Monkees tour a few dates shy of his scheduled performance at the War Memorial. Also on the west side, Jarus, of Canada, has made great progress at 390 Seward Street on a moody, warm-toned portrait of a woman reclining on a couch with a cat. In the Neighborhood of the Arts, U.K.-based artist David Walker has been working on a pair of cool-hued, huge faces casting their wide-eyed stares skyward. Berlin-based artist Karl Addison began work at the Fedder Industrial Complex (1237 East Main Street) on a multi-story portrait of a bearded man he met in Brussels. During the next week, this massive figure will be filled in by an unfathomable amount of multicolored lines. Caitlin Yarsky's portrait of Andy Hammond at Boulder Coffee Co., 100 Alexander Street. 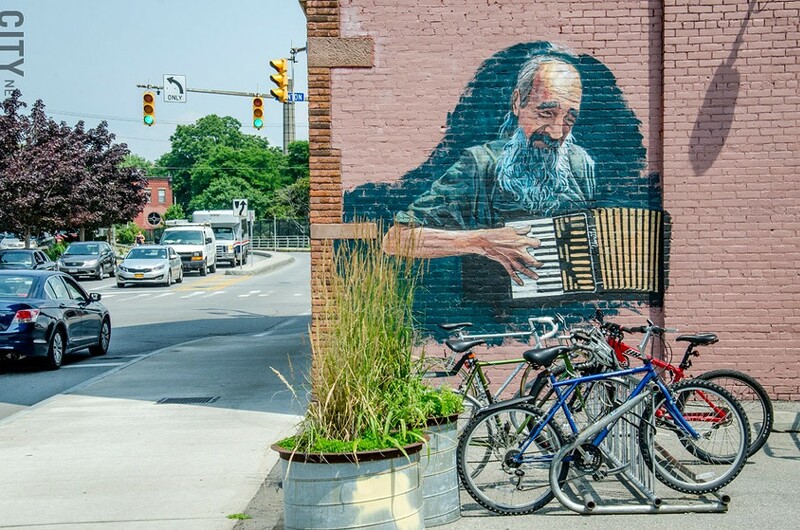 Rochester-based artist Caitlin Yarsky is creating a portrait of accordion player Andy Hammond, a familiar fixture in Rochester's East End, on the side of the Boulder Coffee at 100 Alexander Street. Yarsky's painting joins last year's mural by California-based artist, Siloette, on the same building. Shawnee Hill, also based in Rochester, began laying down linework and some shading on an Art Nouveau-inspired portrait of a woman with flowing locks and inky fingertips on the side of Fuego Coffee at 167 Liberty Pole Way. 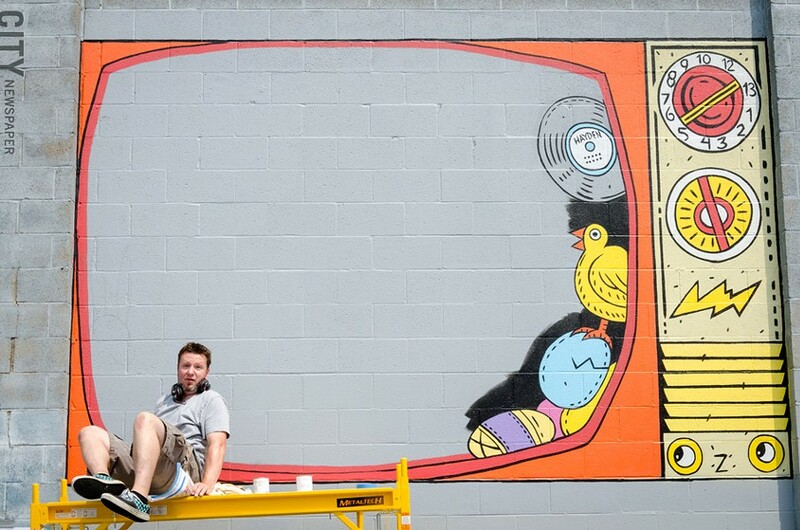 Rochester-based artist John Perry has started work on a mural of a colorful television set, which will eventually feature a portrait of a familiar Rochester face, at the Public Market near the intersection of Pennsylvania Avenue and Niagara Street. John Perry works on his piece in the Public Market. Italian artist Alice Pasquini will arrive by midweek to begin work on a mural on the side of Small World Books at 425 North Street. Pasquini's location is particularly well-matched in that her style is nostalgic and storybook-esque, and that Rocco, the owner of the rambling gem of a used bookstore, also hails from Italy. Reno, Nevada-based artist Overunder will arrive on Thursday, and begin work in an as yet unannounced location.